Dr. Mark E. Richards discusses the potential for enhanced contour and improved cosmetic appeal when utilizing minimally invasive techniques during arm lift surgery. Washington, DC—Many board certified plastic surgeons perform a range of surgical procedures designed to remove the excess skin that can accumulate after significant weight loss, including abdominoplasty, thigh lift, and arm lift. In arm lift surgery, medically referred to as brachioplasty, a long incision typically is made along the length of the arm, explains Washington, DC plastic surgeon Mark E. Richards, MD. However, he indicates that with an advanced technique he developed and published in the Aesthetic Surgery Journal a much smaller incision can be made that offers similar benefits for selected patients and results in an inconspicuous scar. Additionally, Dr. Richards explains that patients experiencing mild skin inelasticity and volume disproportion due to aging, minor weight loss, or genetic predisposition may be helped by non-surgical skin tightening on the arms, often achieved with a device called Viora Reaction™. This treatment employs radiofrequency energy to stimulate collagen production and reduce fat cells. However, individuals with a more significant amount of loose skin will require an operation to achieve a firmer, more toned appearance. Minimal incision arm lift surgery, he notes, is a multi-modality body contouring procedure that utilizes VASER® liposuction to optimize the outcome. The Washington, DC plastic surgeon reveals that he can place the incision within the armpit—rather than spanning the length of the arm from the armpit to the elbow—and pull the sagging skin taut, utilizing liposuction as needed, and create a firmer, more toned, and more youthful-looking appearance. In addition to reducing the size of the scar, he says recovery time will also be diminished in most cases. 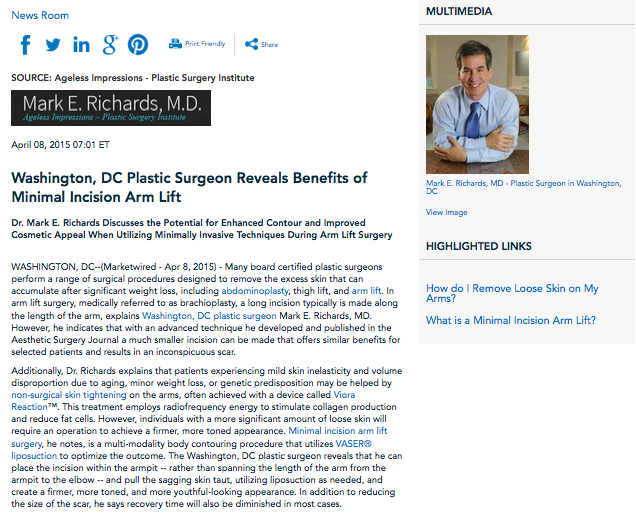 Ultimately, Dr. Richards hopes that with the latest minimally invasive arm lift technique more weight loss patients will be able to finalize their cosmetic goals and more fully enjoy the results of their hard work. He says that losing a significant amount of weight is a great achievement, and the presence of excess skin should not diminish that accomplishment. Dr. Richards is a board-certified plastic surgeon who earned his undergraduate degree from Yale University and his medical degree from the University of Maryland School of Medicine. The founder of Ageless Impressions – Plastic Surgery Institute, he has been practicing for over 25 years in the Washington, DC, Maryland, and Northern Virginia area. He has been the recipient of numerous awards, including being named Top Doctor by the U.S. News & World Report, and he is an active member of several prestigious medical organizations, including the American Society of Plastic Surgeons. He is available for interview upon request.